I was reminded of a discussion between the poet, Kathleen Raine, and the painter, Winifred Nicholson, about the importance of individual strokes (in a painting) and of the placing of prepositions or conjunctions or similar small, connective words (in poems). This Nicholson demonstrated by standing up, covering a particular small brush stroke of that day's work in progress and both painter and poet watched the composition fade and break before their eyes. 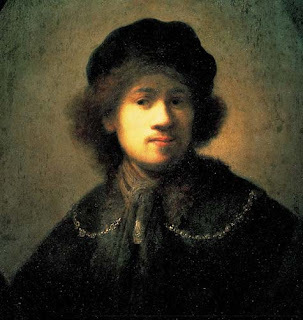 I was reminded too of a Rembrandt exhibition (of drawings) that I saw in Bilbao - the same themes repeated in variations, over and over, the craft of assimilating, understanding the thing seen: the patience of a certain kind of realism, the necessity of compassion to actually create art worth seeing. But Peter is subject to the devilment of beauty - in Greek - devil and beauty share the same root. A certain kind of it lures you with an aching desire. It does Peter, in an absence in the art he has failed to find to show, and in prsence in Mizzy (his wife's brother who comes to stay) and it is ultimately disillusioning and the disillusionment can both break or redeem. It will break Mizzy, the gilded, ill-starred youth who has never emerged from under his family's misplaced hopes - it makes his manipulation of others too easy, too emptying - and it may make Peter. The devil may be necessary but woe to you if you dance with him too long! His beauty is transient - it breaks out and over in youth but will not rest and stay. It cannot be possessed only enjoyed and is fatefully taken too seriously. Peter's 'disappointing' daughter is knowingly called 'Beatrice' but Bea, unlike Dante's muse, has grown up without retaining her early parentally projected promise, no wonder she takes refuge in a second rate hell: a hotel bar in Boston. The book did not make a great advertisement for owning a gallery! I could recognize from my own limited experience that sense of how you tolerate the 'good enough art' and how your liking for the artist can so easily distort your judgment; and, how you hope that you maintain a certain consistency of judgment and yet fail! But I came back to that sense that good art is in the imagination of the life of others - and here it is betrayed by 'concept' and 'affect' and indeed 'scandal' - the world you imagine may be populated by 'imagined others' as in Leonora Carrington or actual others as in Rembrandt but as in life, so in art, what makes it work, is being able to take that step beyond 'self-expression' into an embodiment that compassionately embrace s others and in doing so discovers a self worth inhabiting. This is, I expect, a path of continual disillusionment (in life as well as art) but one through which we do receive glimpses of glory (both glamorous and ordinary). 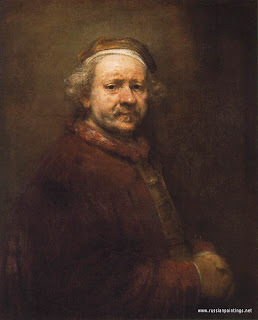 It is, in fact, the trajectory of Rembrandt's self-portraits from the self-expressed youth eagerly foolish to the wise clown, knowingly foolish, compassionate for self and others!